A custom QR Shelter-In-Place Instruction Decal can provide a link to current local contact phone numbers and local procedures. 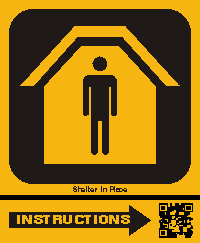 A custom QR Shelter-In-Place Instruction Decal in the Shelter-In-Place room(s) can provide a link to up-to-date written instructions, diagrams, photos and videos as well as local emergency response phone numbers and contact names of employees and governmental agencies as well as phone numbers and directions to other Shelter-In-Place locations in case of overcrowding. A) Written Instructions may include specific procedures for the safety of persons confined to the Shelter-In-Place room. Written Instructions can be done with a series of pages, each page relating to a specific safety or courtesy issue. B) Diagrams are useful for showing room layouts and specific safety procedures without the use of language. C) Photos are useful for showing room layouts and specific safety procedures without the use of language. D) Videos are are useful for showing room layouts and specific safety procedures without the use of language.